Beautifully done. I love knitting from your patterns and keep a stash of knitted hats because you never know when a family member or friend will need one. Bless you. How might I modify your hat patterns using a thinner yarn that uses a size 6 needle? Cast on 113. This will make 8 repeats of the pattern around the hat instead of the 6 with the thicker yarn. I love these hats and am going to try them. I have never used DPN’s before, so it should be fun. One point however, many cancer patients who lose their hair cannot tolerate a seam in their hats. My partner could not. Neither could some of my friends who had cancer. Just wanted to point that out, but not to stop people making them. It’s easy to adjust to round needles and then there is no seam. I need a yarn that has no wool. So I can only think of an acrylic yarn… Is there anything that identifies a finer yarn? Do I want a finer yarn for one of these caps? Kinda new at this,so any help is appreciated! The pattern is written for a worsted weight yarn which is also called medium or #4. Acrylic works well and a soft cotton is also very nice. I knit for chemo patients and I use Comfy worsted or sport from Knit Picks. It is 85% Pima cotton and 15% acrylic. There are many colors and it is very soft. The price is very reasonable. Just Goggle Knit Picks. You won’t be sorry. Delivery takes about 5 days. If you order $50 worth, shipping is free. Hi. Thanks for posting such lovely patterns, I just showed some to my mom and she’s excited to begin on yet another knitted cap, since it seems that we can never knit enough. Might I just make one suggestion. Could you perhaps consider adding to your patterns the number of stitches to add or subtract for larger or smaller sizes? I’ve noticed that most of your patterns feature this question in the comments section and it might save you having to reply every time this question is asked. Also I love being able to knit something in a range of sizes for the whole family. Thank you so much, I’ll definitely be visiting your site regularly from now on! Lovely patterns, thanks for sharing. Hi, I plan to make one or both patterns and send them with mine to Knotsoflove.org which is founded by Christine Fabriani. Maybe she will like your 2 patterns and put them also on the website for chemo patients across USA? I am using DK soft wool from the U.K. I usually use U.K. knitting needles. Are your patters for American Knitting needles or Canadian, or U.K.? My patterns are American, but I do give mm measurements for needles as well. Howdo I alter this pattern to make a woman’s size large? Thank you! I love your patterns! Have made a number of children’s hats and the response has been amazing! How do I alter this pattern to make it a woman’s size Small? It wouldn’t need to be much smaller. One size smaller needles should do it. was wondering why I can’t pin this pattern to Pinterest. Thanks. Beautiful patterns. Do you have the pin button on your toolbar? It should work with that. We haven’t added pin icons to the patterns yet, but they will pin with the Pinterest add-on button. 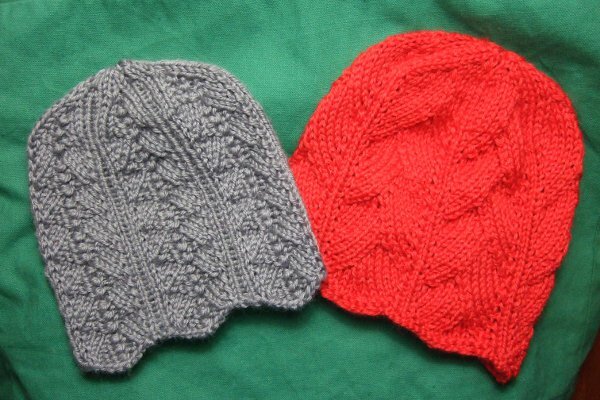 It is my understanding that Chemo Caps should be knit in the round because the seam irritates the tender scalp. Am I mistaken? In-the-round is my personal preference, but many knitters don’t knit in the round. If the seam is made carefully, it doesn’t have to be as bulky. 32 stitches used does not work with 84 stitches. one. ssk and k2tog stitches use 2 stitches and result in one stitch. Sorry. I don’t currently have any crocheted hat patterns but there are lots available online.